A Canada flag blows in the breeze above the visitor centre in Tobermory on the Bruce Peninsula in Ontario, Canada. 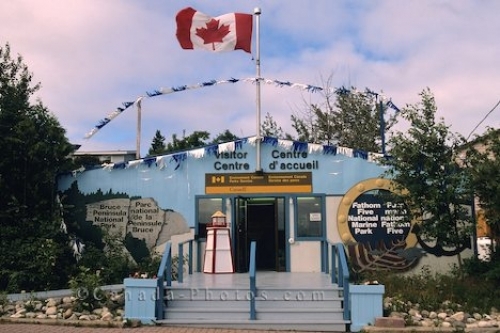 When visiting Tobermory on the Bruce Peninsula in Ontario, Canada, stop at the visitor centre where you can find out any information that you may be looking for about the surrounding area. At the visitor centre you can climb a tower for a scenic view of the Bruce Peninsula, enter the theatre and watch the show, explore the exhibit gallery and buy some souvenirs in the gift shop. Picture of the visitor centre in the town of Tobermory on the Bruce Peninsula in Ontario, Canada.